This Mediterranean delight of a dish is quick, easy, and the perfect weeknight meal for one. It's surprisingly tasty and full of flavor for it to contain such few ingredients, making this a truly budget gourmet recipe. 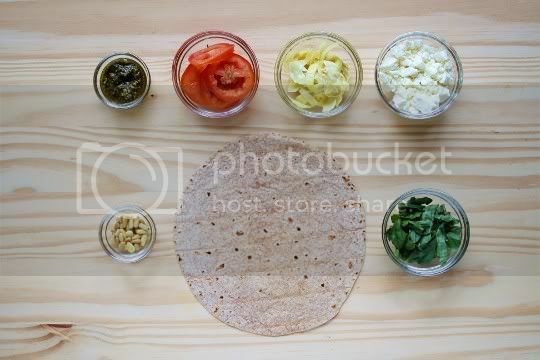 The "pizza" uses a whole-wheat tortilla for the crust, but you could probably sub out any similar bread of your choosing: lavash, pita, flatbread, or an actual pizza crust. 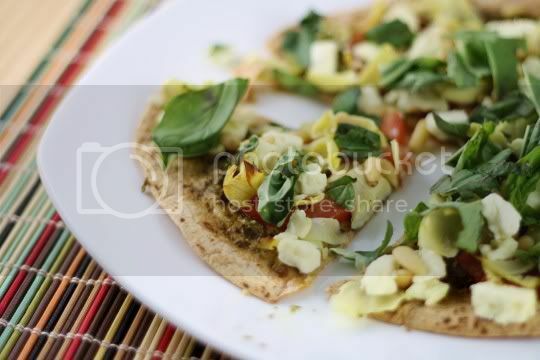 Simply spread the tortilla with pesto, then top it with thinly sliced tomatoes, sliced artichoke hearts, crumbled feta, and pine nuts. Bake it until the edges are crispy, top with fresh basil, and eat! Every ingredient works so well together. The tomato gets soft and sweet in the oven, the artichokes have a tangy brininess, and the feta adds a creamy salty flavor (if you want to make this vegan, you can easily omit the feta, as the artichokes provide plenty of salt). Also, you probably can halve the amount of feta used: two ounces per pizza is a lot, and I think one ounce would do sufficiently. 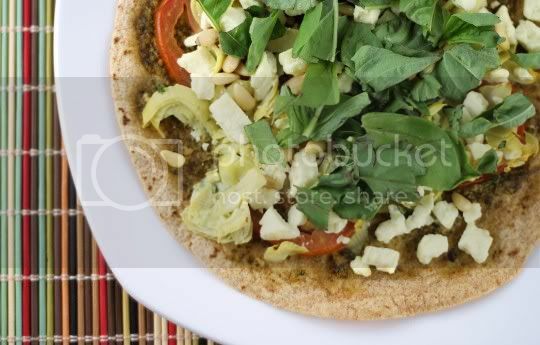 The pine nuts add a bit of crunchy texture, the basil is a perfect sweet herbal finish, and the pesto ties everything together. Another reason you may want to try a different base other than a tortilla is that the tortilla gets a bit soggy in the center. The edges stay crisp and make each wedge easy to pick up, but the end will start to droop with all the heavy ingredients. I think a pita may actually work better here...or you could try lots of variations on this, such as Mediterranean "nachos" or other bite-sized appetizers. Whatever you decide, you're sure to be satisfied! Make again? Definitely. Quick, cheap, and easy...and a delicious meal for one. Vegan variation: Use a vegan pesto, and omit feta or use a vegan cheese. yay for vegan variation! thanks! I am thinking this would be a great make your own meal for a family after a long hot day at work!